The Wilcox Estate is comprised of three separate accommodations: Kauikeolani Main Residence together with Umetsu Cottage & Palaka Cottage. 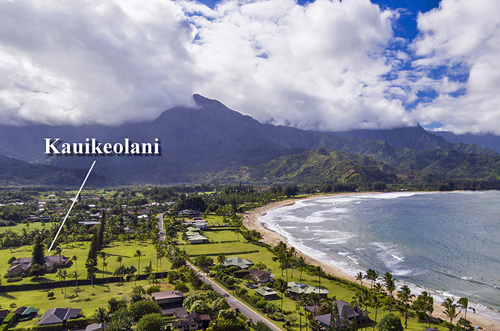 Settled into a small corner of the world, the Wilcox Estate is located in the quaint, locally-favored town of Hanalei. Mature gardens, expansive lawns, grazing pasture, and an ancient Hawaiian fishpond are just a taste of the treasures which await discovery at Kauikeolani. Encompassing 74 acres, the estate is bounded by a river on one side and beach frontage on the other, a playground which begs for casual exploration. Discover yourself in a place of timeless fantasy, where a crystal blue tide rolls in upon the sands of a crescent bay. In such dreams, Albert Spencer Wilcox found the inspiration to build his life around the Kauikeolani Estate. Born the fourth son in a Protestant missionary family of eight boys, Albert grew up surrounded by the enchantments of 19th century Kauai. His parents, Abner and Lucy Wilcox, forsook all that was familiar to them when they stepped aboard the sailing ship Bark Mary Fraizer and took to sea in 1837, the eastern seaboard falling forever behind in the wake of their dreams. Their passage took them from Boston to Honolulu, 116 days around Cape Horn, crossing the boundaries that separated Hawaii from the rest of the world. On these distant islands, they found not only a calling for their church, but also the embodiment of fantasy. A wild Polynesia, intact in its culture and rich with intrigue awaiting them in their new home. Growing from a child into a man, Albert was said to have become an industrious and likable character, eventually finding his success as a sugar planter around the turn of the century. The North Shore of Kauai had always been his home, and as his coffers grew so did his land holdings in Hanalei, his birthplace, and the place closest to his heart. In 1898 he married, taking Emma Kauikeolani Napoleon Mahelona as his wife. He adopted her children, and eventually her namesake to become that of his estate. The Hawaiian language is imbued with meaning; Kauikeolani is a "vision that comes in the early morning mist." Settled into a small corner of the world, the Wilcox Estate is located in the quaint, locally-favored town of Hanalei. Mature gardens, expansive lawns, grazing pasture, and an ancient Hawaiian fishpond are just a taste of the treasures which await discovery at Kauikeolani. Encompassing 74 acres, the estate is bounded by a river on one side and beach frontage on the other, a playground which begs for casual exploration. The Estate is comprised of three separate accommodations. Kauikeolani, the once primary residence of Albert and Emma Wilcox, remains as the central structure upon the land. The original home dates back to 1877, at which time it was a comparably modest structure of only three bedrooms. However, as the Wilcox generations grew, so did the walls of Kauikeolani. Today, the main house is comprised of seven bedrooms and six baths, comfortably accommodating a total of twelve guests. In days gone by when Albert and Emma filled these rooms with their children and their laughter, they had a need for servants to help in the maintenance and upkeep of their home. What were once residents quarters for the help have now become vacation getaways upon the property. Modest only in terms of their historical comparison to Kauikeolani, the cottages are charming in their own rights. Each with a flair all its own, the two other available accommodations on the Estate can be reserved exclusive of one another, or in conjunction with the main residence. In this flexible arrangement, a romantic getaway can escape the attention of the outside world, or a whole array of friends/family can be entertained, utilizing the entire grounds as a special occasion. With so much charm and warmth surrounding you, it is often hard to break away from the estate grounds and explore the bigger enchantment which is the island of Kauai. However, Kauikeolani is but a haven within a heaven, sitting upon the threshold to a whole world of magic and adventure. Perhaps it is that Kauai, being the oldest in the chain of Hawaiian islands, is the most stubborn and unwilling to change. Estimated to be approximately 7 million years old, the island is but a small eroded remnant of a much larger volcano, long-since extinct. The elements of wind, rain, and surf have over the eons whittled away at the rock, sculpting the land into a varied terrain of deep verdant valleys, vertical cliff walls, and long meandering seashores. Kauai is a playground for the adventurous spirit. Many island trails have no beginning or end. Muddy your bare feet as you walk through an endless garden of fragrant wild ginger. Duck beneath a thicket to discover an empty beach or climb to skirt the ridges which stand high above the flanks of sheer valley walls. It is arguable that Kauai is presently at its most beautiful state of evolution. The erosive powers that will eventually take the island back down into the sea, have today created a most flamboyant display of nature's handiwork.